January 1, 2014 was also a new moon. 2014 was actually a very special year, looking at how the moon phases match the months' beginnings and endings. I do not consider myself to be an astrologer or a moon expert. Still, I do read about the main qualities of a month. If the moon is able to influence the tides - well, who knows what else is influenced..
What I remember about the new moon: it is a time to release, to start afresh and to set an intention for the upcoming month. Having the new moon at the first of the month AND the first of the year - I consider that a pretty powerful and auspicious moment. Now, don´t worry if you missed January 1 - the following reflections are always valid and will still set you off on a more focussed road for this year - better late than not! Here´s what I did during the holidays: reflections on the past year - what did I learn, achieve, enjoy? If you are on facebook, there´s the "year in review" function: it pulls up 20 or so life events - I enjoyed looking through them - really, was it only this year? What´s no longer needed in your life? What do you want to let go? Write it on a piece of paper - and burn it. The kitchen sink will do . It´s your intention that´s important - to release it and let it float out of your life, just as the fire smoke floats up into the sky. Then - you may want to sit down and do a new year collage. Just as easy - and even more fun - than burning the old: create the new! Here´s what you need: a piece of cardboard, scissors, glue - and a few journals, magazines with colorful pictures. I like to sit at my big living room table - and light a candle, as that puts me into a special mood. Oh, and a cup of tea and some nice music. Once all is laid out, I sit for a moment in quiet recollection, and just keep this new year in my mind. What´s up next? Then I just take the journal that most inspires me - and flip through the pages, ripping out the pictures I like. Loads of pictures, lots of ripping - it´s FUN! This year, I was struck by a picture of some jellyfish in the evening sun - they glowed like UFO or neon-plates. Then, arranging it on the cardboard - playing with the images and the colors until I really really like it. Until it feels right. Then the glue - and voilá… DONE! 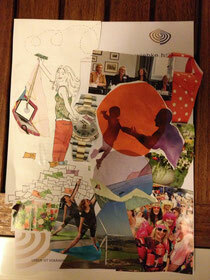 The picture shows a collage I did during 2013 - about more sports, yoga, trust - and a balance of family and work. Let me know how it goes! You can reach me via email - or subscribing to my newsletter to stay tuned for the 2017 events. Thank you so much for your great inspiration Wiebke !